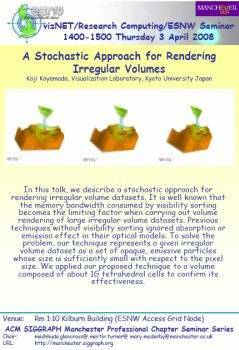 In this talk, we describe a stochastic approach for rendering irregular volume datasets. It is well known that the memory bandwidth consumed by visibility sorting becomes the limiting factor when carrying out volume rendering of large irregular volume datasets. Previous techniques without visibility sorting ignored absorption or emission effect in their optical models. To solve the problem, our technique represents a given irregular volume dataset as a set of opaque, emissive particles whose size is sufficiently small with respect to the pixel size. We applied our proposed technique to a volume composed of about 1G tetrahedral cells to confirm its effectiveness.